“Down with astronauts!” No, wait, maybe that’s space men? Aliens? No idea what they have against space men, aliens or astronauts. Well, maybe aliens, especially if they have been probed. I had to take this picture just because of that huge strawberry. He had a wish for the fountain in the back. He can fill it with chocolate or fruit punch for now. 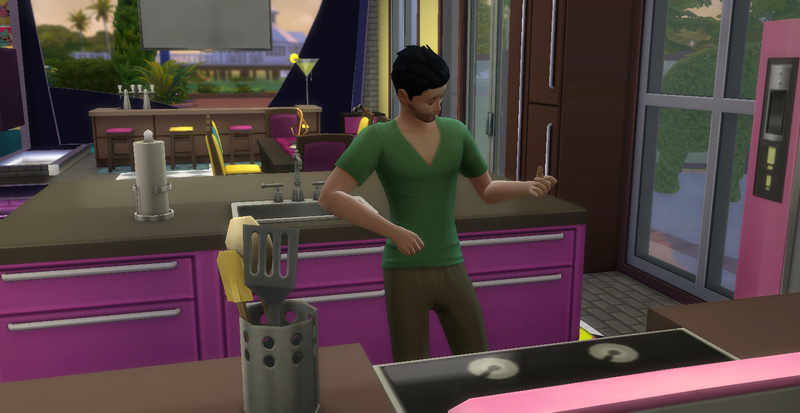 Once he gets his cooking or mixology level higher, he can fill it with different beverages. He got the huge chocolate covered strawberry from the fountain. Yum! Chase (redhead)” You WILL be my friend” Not sure morphing oneself into someone else is the best way to become friends with someone but whatever floats your boat, Chase. On a side note, I apologize to anyone who follows my blog for not posting daily. Some days, I’m too tired to play or come up with funny pictures. I just got diagnosed with breast cancer and it’s been a whirlwind of activity which tends to wear me out. Tests, tests and more tests. Bleah! 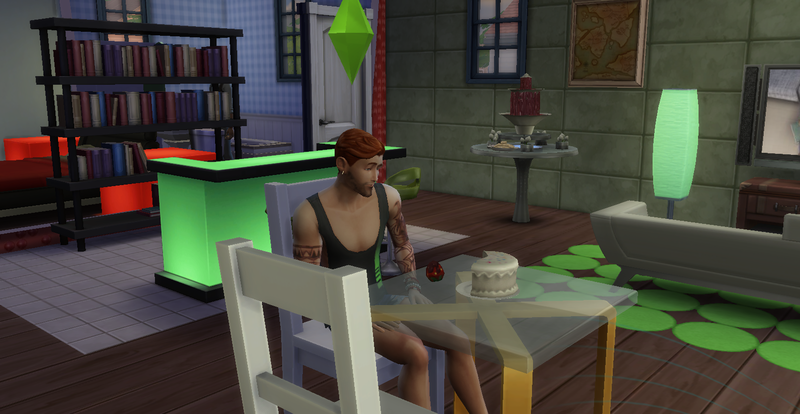 I broke down today and bought the Spa Expansion pack for the Sims 4. Took me a minute to figure out that I had to place the spa on a lot before my Sims could visit. I sent my very pregnant Sim there. She’s in the 3rd trimester and luckily didn’t go into labor while there. 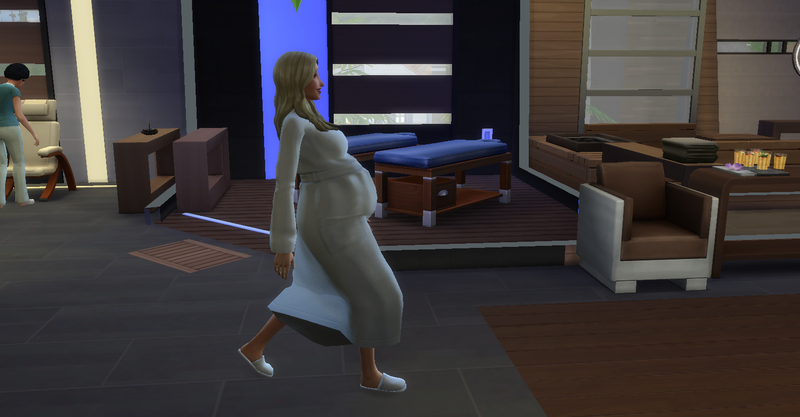 I found out that pregnant Sims can not have a massage or get in the sauna. They can get a foot/hand massage, mud bath or soak and can drink the fizzy drinks. Not sure if she can do yoga, the class was already in session when she showed up. I like how they automatically change into a robe when they arrive. Hand massage time! Ok, I know, she’s not wearing tasteful maternity clothes. One of her traits is insane so I left her like that plus I think her husband likes the outfit. He won’t leave her alone unless I make him do something else. Nothing beats drinking a Spa drink and talking to oneself. She had great moodlets when she left, one from foot massage, hand massage, having a nice soak and sipping a fizzy beverage. Not the best family portrait but she went into labor, he’s flirty and has to pee and the other two, not sure what they are doing or about to do. 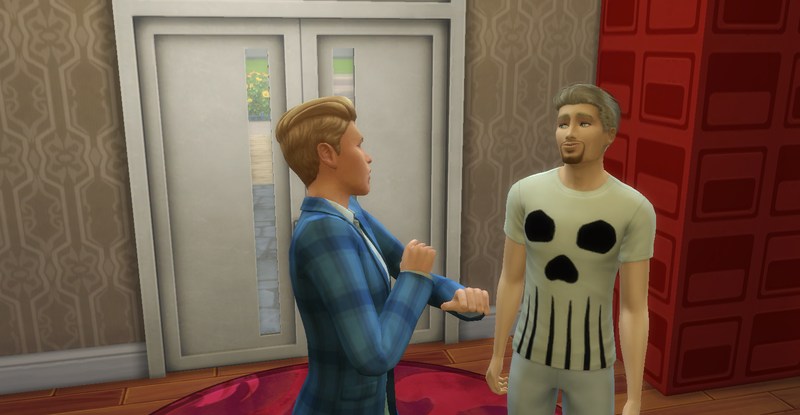 If you play Sims 4, you probably guessed that’s Johnny Zest. He apparently likes to have kids. He keeps rolling wishes for them. I’m stopping at three. I love the look on his face. Surprised and worried all at the same time. Yea, well, you were the one who wanted to eat a bug. His LTW is Outdoor Enthusiast. He doesn’t look that thrilled with this particular challenge. What exactly is she looking at? Judging by her expression, it must be horrific. Nice air guitar moves there. Seriously, I have no idea where his guitar is located. It’s not on the floor or in his inventory. But he’s definitely jamming on something. Umm? Is she hugging Dennis or her sister? I think she’s trying to hug her sister back there. 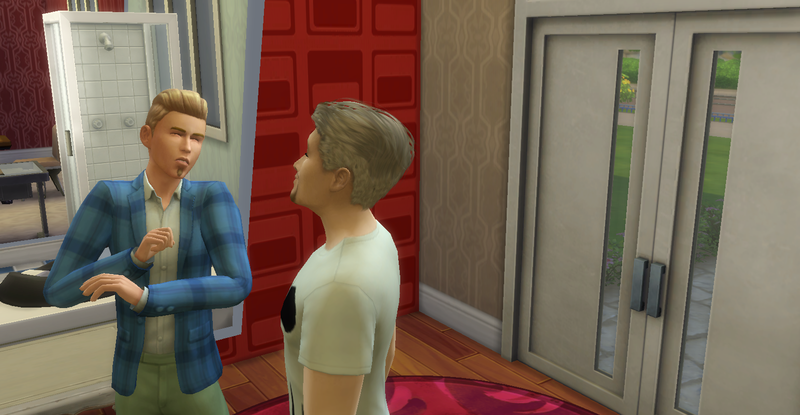 Even Dennis looks confused and annoyed by this weirdness. “No. Really, I did. 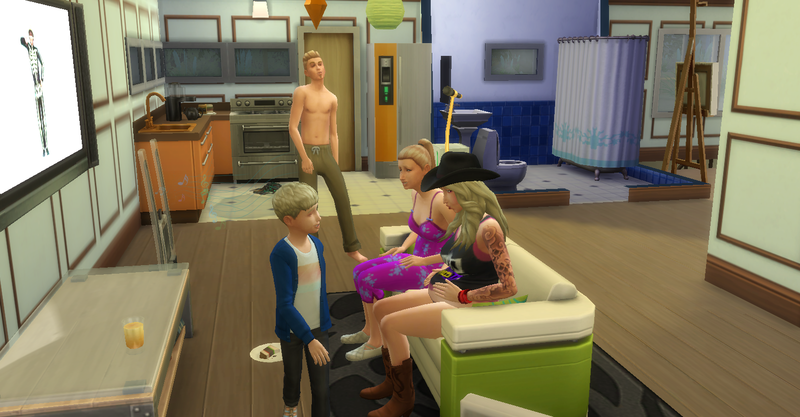 I put this over here like this and then….” I don’t think my Sim believed him at all. Not everyone is ready to party. Blondie looks like she’s having second thoughts. 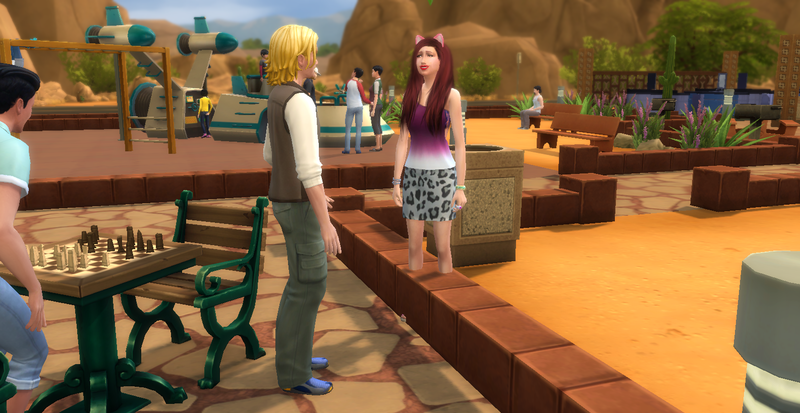 That’s a very annoyed Sim … who invited her anyway? The party wasn’t too bad. Not much exciting happened. Talking, dancing and eating cake. 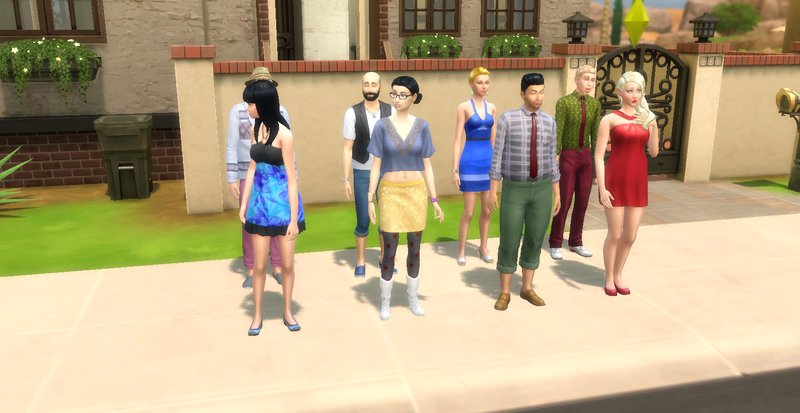 My Sim didn’t throw this party but received a call from her friend who invited her to her birthday party. At the end of the party, her friend said “Thanks for coming. I guess that was a good party.” Sheesh. I’m not sure how to make a party great when you don’t throw it. I’ll have to ask around. “Maybe he won’t notice me if I am one with the bricks” Nope didn’t work. He noticed. And followed her into the community room. “If I try hard enough, I will become one with the rug.” Notice the guy there…he left rather quickly when she laid down. I recently got the patio pack (forgot the name of the pack) I think maybe Outdoor Patio. 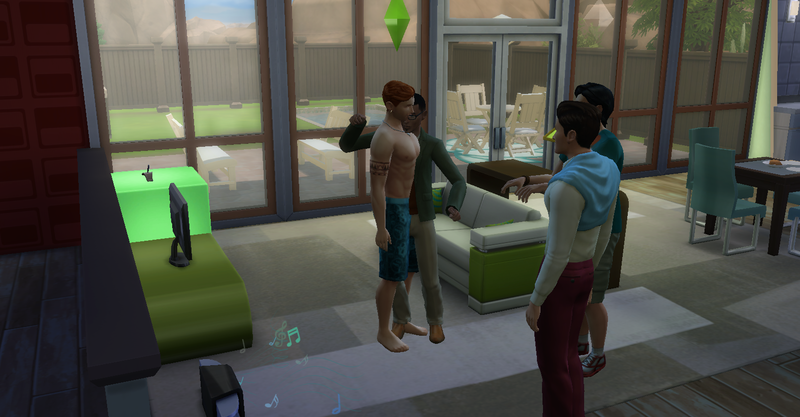 Anyway, I gave my sims a hot tub and now I can’t get them out. 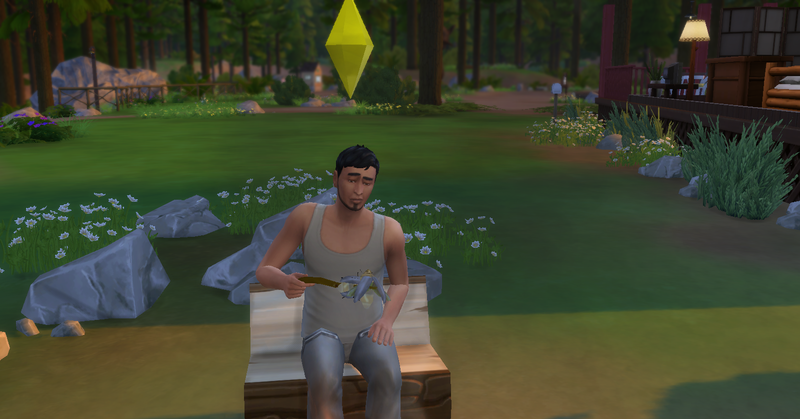 The only way to get them out is to control them but then they constantly roll wishes to woohoo in hot tub. My husband said, “isn’t that what hot tubs are for?” Ha Ha! Now for something Sims related that’s not a picture…I found out that Bing gives you points for using their search bar and that one of the rewards is a (measly) $5 Amazon card. Should be more than 5 bucks but whatever. Anyway, I managed to save up enough points for two gift cards and used them to get the above mentioned pack for free. Yay for me! I wanted to put Woohoo( instead of yay) but I can’t look at that word anymore without thinking of you know *nudge nudge wink wink*. 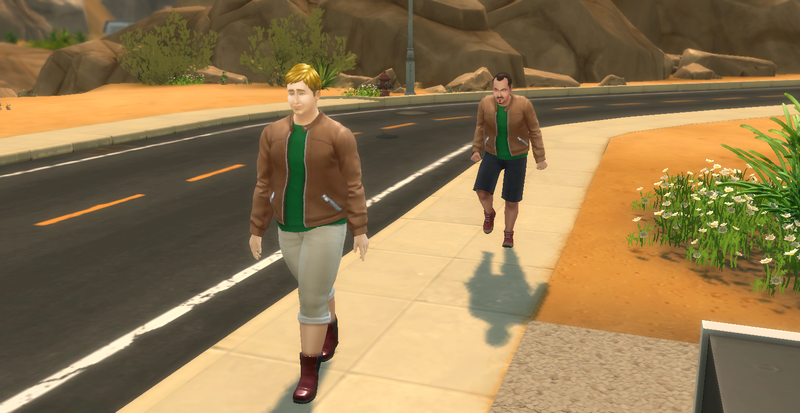 Ever have one of those days when you catch someone wearing the same outfit as you? Well, this guy did and boy is he pissed! 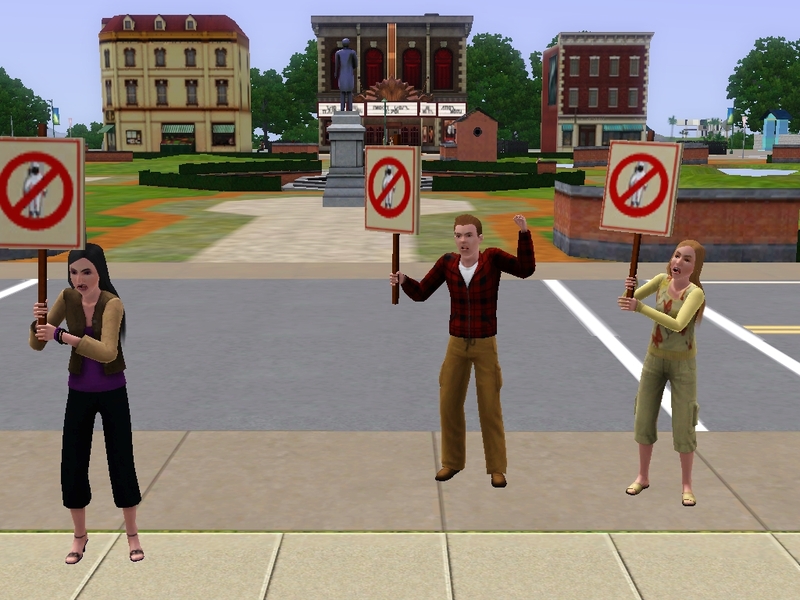 These two Sims aren’t even mine so I had nothing to do with dressing them. 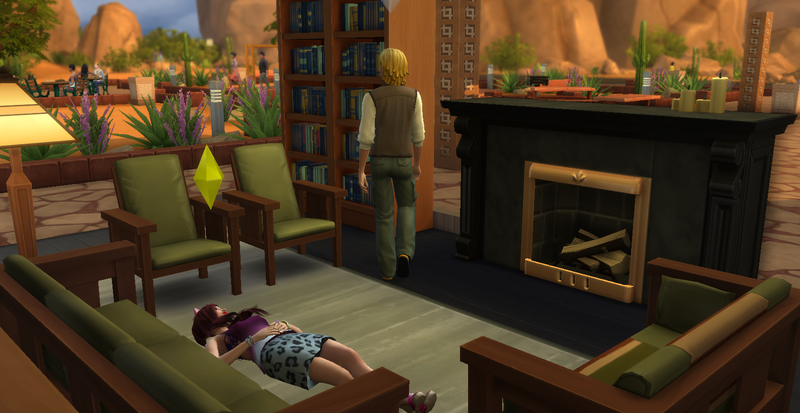 “what a nice spot for a nap” Autonomous screw-up provided by my crazy Sim. She was supposed to go outside and look at clouds. On a totally different subject, I’ve been sans internet for 3 weeks now. We moved to a new house and just now was able to get the cable hooked up. Living without internet is odd. I thought that we didn’t use it that much but turns out we use it a lot to look info up, check email and watch TV. Back to simming!